MOSCOW, Russia -- Russian officials pressed Ukraine on Monday to declare a cease-fire with separatists, but Ukrainians say they are locked in a war not just against the rebels but also against Russia — on behalf of Europe. Lost territory, trapped soldiers and increasing reports of Russian tanks and troops operating in eastern Ukraine have changed the course of events in the past few days. Newly emboldened separatist forces are bearing down on strategic targets, such as the port city of Mariupol — which the Ukrainian military maintains it can defend — and the airport in Luhansk, where troops retreated in the face of a rebel onslaught Monday. 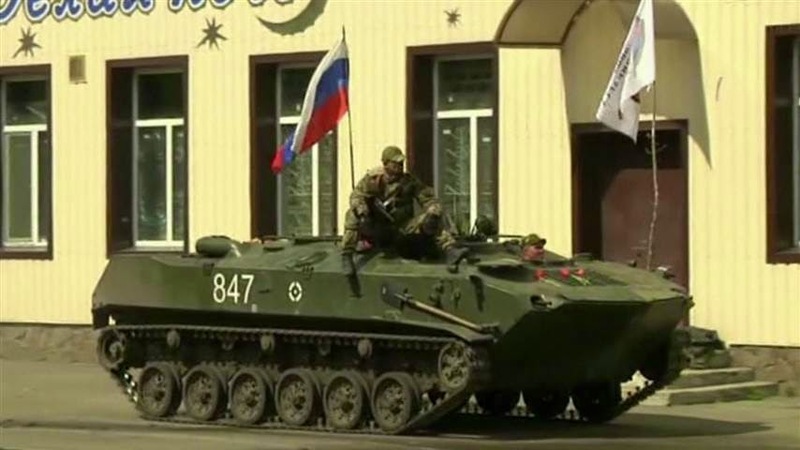 Ukraine and its Western allies have surmised that Russian forces are significantly aiding pro-Russian separatists. The summit will coincide with a self-imposed deadline from the European Union to announce further economic sanctions against Russia . European leaders agreed over the weekend to slap Russia with new measures within a week — unless it pulled back from Ukraine. But Russia maintains that the E.U. threats are weak and that it is not militarily involved in the Ukraine conflict . Lavrov also scoffed at the idea that pro-Russian militias would surrender their weapons to Kiev, which he said would be tantamount to “destroying themselves,” even as he pledged that “there will be no military intervention” from Russia. A spokesman for Ukraine’s military said Russian forces fired on troops at the Luhansk airport Monday and are supporting the separatists surrounding Ilovaysk, where hundreds of Ukrainian troops have been trapped for more than a week. Russian officials have accused Kiev of not taking advantage of the separatists’ offer to let the troops out via a humanitarian corridor, in exchange for disarming. During a Monday visit to Kiev, Sen. Robert Menendez (D-N.J.) called for the international community to respond by better arming Ukrainian troops. “It’s great to provide night-vision goggles,” Menendez said at a news conference, referencing one form of assistance the United States approved to send to Ukrainian troops this summer. He dismissed concerns that arming Ukraine would spur a negative response from Russia, listing significant events of the conflict, including Russia’s annexation of Crimea in March , the downing of Malaysia Airlines Flight 17 and the recent battles in the east, to make his case “Russia has done all of this without any provocation,” he said. Pro-Russian rebels are stepping up their demands, too. Ahead of a meeting in Minsk, Belarus, among Kiev representatives, separatists and their interlocutors, Andrei Purgin — a Russian rebel leader in Donetsk — told the Russian news service Interfax that separatists intended to seek “recognition of our independence” during the talks. The Monday discussions yielded little progress. Putin said in a television interview that aired Sunday that “statehood” for eastern Ukraine should be part of talks to resolve the conflict, but he has repeatedly insisted that he wants greater autonomy for the region, not the breakup of Ukraine — despite Russia’s seizure of Crimea. In the interview, Putin scoffed at Europe’s support for the Kiev government, arguing that it ran counter to purported European values. “What are the so-called European values?” Putin asked. “Maintaining the coup, the armed seizure of power and the suppression of dissent with the help of the armed forces? Are those modern European values?" “Our colleagues need to remember their own ideals,” he said. Putin stressed that a resolution to the conflict “largely depends on the political will of today’s Ukrainian leadership,” but said he did not expect the fighting to stop before Ukraine’s parliamentary elections, set for Oct. 26. Once elected, Ukraine’s new parliament is expected to vote on a law to end the country’s nonaligned status, paving the way for it to eventually apply for NATO membership. Rasmusssen told reporters Monday that Ukraine’s chances of being adopted as a member depend on whether the country can meet various criteria. Quote: "«Поэтому, когда идет вот эта война, нужно задуматься нам вместе с ними, что нам дальше делать, в какой стране жить? Нам обещали и Порошенко и Кличко, что к власти не придут ни миллиардеры, ни миллионеры. А они снова во власти. Вот сейчас будут выборы, если они будут, если эта страна останется, то этих миллиардеров во власти не будет. Мы их снесем придем. Мы будем разговаривать с ними (с ополчением – Ред.). Будем называть их противоположной стороной. Будем стараться, чтобы они задумались тоже над тем, что они хотят. И мы их хотим понять», - заключил представитель батальона «Айдар»." It is interesting proposal by a solder from "Aydar" battalion. The question would be if Mr. Putin would be interested in disclosing, what is the major points in relations with Ukraine he want to change. As I see it, there could be no conditions installed, which will allow future annexation or separation of Donbas from Ukraine; there could be no veto power of any kind given to the region. All other things could be successfully negotiated. Quote:"Президент Европейского совета Герман Ван Ромпей констатирует, что на нынешнем этапе конфликт в Украине не может быть урегулирован политическим путем из-за недостатка воли российских руководителей. Об этом Ромпей заявил в своем традиционном выступлении перед дипломатами стран Европейского союза." "«На сей раз мы – сторона решения, чтобы не сказать – сторона кризиса. Если Украина сдаст Соглашение об ассоциации, конфликт будет завершен очень быстро. Но они этого не сделают. После Майдана - это столкновение ценностей», - убежден Ромпей." Good description of the reality. It is the fact that Russian Government is the problem, they should let Ukraine make it choice and then, make some attractive proposal to Ukrainians, which would be an attractive enough to win their hearts. For instance Russia could create special economic zone in Russia which will include Voronezh Oblast', Rostov Oblast' and Kuban region. In this special economic territories Russia could begin Euro Integration on its own terms by adopting European standards for its industries. That will boost the economy and will make its industries more competitive on those territories. After a period of time results will convince every one to expand such changes to the rest of the country or to another territories.